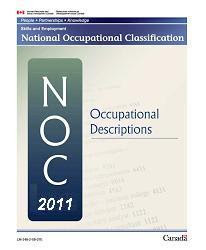 National Occupation Classification (NOC) 2011 Version - Gateway to Canada | Canada Immigration Consultancy! If you are planning to apply for permanent residence in Canada under the Federal Skilled Workers (FSW) program, you must consider the changes in Canada's National Occupation Classification. On January 31, 2012, Human Resources and Skills Development Canada (HRSDC) and Statistics Canada replaced the 2006 edition of the National Occupation Classification (NOC) with a 2011 version. Citizenship and Immigration Canada will assess FSW applications received at the Centralized Intake Office after January 31, 2012 according to the new NOC system. As of this writing, there still 20 occupations open (cap not reached yet) and some of these were affected by the changes in NOC. I will post a summary of these changes later.